Before joining The VibroCounts, Jim Lopez played lead guitar for Moonlight Reef, a Sacramento-based original surf instrumental group. He performed with them at Old Ironsides, Duke's Coffee House and Cafe Montreal. Jim creates his vibrato-driven music for The VibroCounts on one of two Fender American Stratocaster guitars (American Standard in Vintage White or a 2000 American Series in three-tone sunburst) or a blue Fender '62 RI Jazzmaster played through a Fender tube Reverb unit into his Fender Twin Reverb amplifier with two monster 12" Electro-Voice speakers or a vintage Fender Showman amp with a custom Dual Showman speaker cabinet. 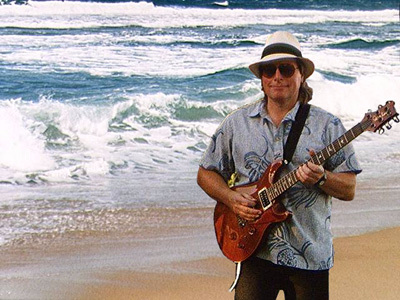 Born and raised in San Mateo, California, Jim loves playing guitar and bass. Jim possesses an intense passion for spooky surf tones... with plenty of reverb! By day (or whatever hours he's working this month), Jim is a supervisor in ticket sales for an airline at Sacramento International Airport. Before The VibroCounts, Cliff Adams played bass with the S.A.M. Blues Band, Holy Cow & the Hindus, the Travel Agency, Andrew Staples, A Resounding Tinkle, and the Lazy Boys. He debuted playing lead guitar for We, the People in 1963 and later became one of many interim rhythm guitarists with the Beau Brummels. Cliff has performed in St. Louis, Kansas City, Chicago, Austin, and in California at Winchester Cathedral, Carousel Ballroom, Avalon Ballroom, Fillmore Auditorium, Winterland, and Alumni Grove. Cliff plays a Dakota red Fender '62 Reissue Jazz Bass and, for his sets on guitar, a candy-apple red reissue Fender '62 Jazzmaster he customized with Seymour Duncan vintage pickups, or a blonde Squier '51 with a Seymour Duncan lipstick pickup, but still occasionally breaks out his stock '67 Gibson SG Special. 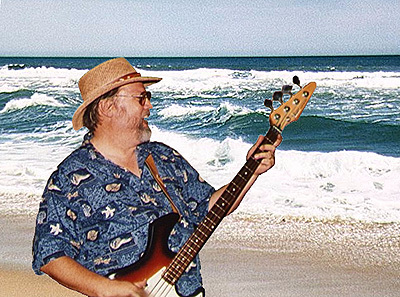 For bass leads (Lonely Surfer, Theme from Endless Summer), he uses a Danelectro 6-string bass. Cliff plays through Fender M-80 and SWR Basic Black amplifiers, developing over 325 watts through an 18", two 15", and two 10" speakers, as well as two horns for a bass sound as tactile as it is tonal. By day, Cliff is a graphic designer, but his career(s) have been as varied as his taste in Hawaiian shirts. He has been a partner in an advertising agency, driven race cars, written for Road & Track magazine, edited a monthly arts journal, been disk jockey and music director for a college radio station (and a midnight-to-six dj in Buda, Texas), repaired avionics for the Air Force, sold stuff at Radio Shack, taught a 3-unit honors course on Comic Books at California State University Sacramento, directed amateur films, coached soccer, T-ball and rookie league fastpitch softball (1999 & 2000 league champs! ), and had a high school painting displayed at the San Francisco Museum of Modern Art. Prior to forming The VibroCounts, Paul Narloch has played drums professionally for over 30 years. Paul debuted with the surf band the Pursuers in 1962. Paul then provided the backbeat for The What in 1964, and later for a variety of acid-rock bay area bands, including the late 60's Buckwheat, who opened for A.B. Skyh, Charlie Musselwhite and Tower of Power at the California State Fair. After playing in many Sacramento-based rock groups, Paul joined TohLaTrez and most recently, the SurfLiners. Paul sets the pace for The VibroCounts on a vintage set of Ludwig drums. By day, Paul runs his own business as a sought-after handyman, using his skills to brighten up landscapes throughout the Sacramento area. Jerry Weaver has played guitar from a young age: as a freshman in high school, he developed his love of the instrumental surf sound. In 1964, he began teaching music at a local music store. In addition to playing tasty leads for the VibroCounts on an amber Paul Reed Smith Custom 24 "10-Top" guitar, Jerry enjoys pumping out driving leads with his Fender Stratocasters. Jerry employs a vintage tube 70's Fender Twin Reverb with two 12" speakers to obtain that crystal clear, wet reverb sound of the original surf era. When playing in the Flamenco del Mar amplified or acoustic sets, Jerry plays a nylon string Ramirez 2CWE or his 1969 Martin 000-28C. Although Jerry's main axe is an amber PRS Custom 24/10T, he also enjoys playing a 1973 American strat and several MIJ strats. The Fender Twin, '76 USA, 135watt & 110~240volts (main amp) is the main outdoor amp, while the Fender Super Reverb '65 Reissue is used in smaller club settings, and a Marshall, VS100 Combo serves well for rehearsals. Effects (rarely used) include a Pedal Reverberator; Ibanez Tube Screamer, and a Mackie DFX-12. Music/Productivity Software: MS Office 2000 Premier Version; SlowGold 5.0; Finalé 2001. And, no matter how fast I update this site, Jerry will have other guitars that are newer than the update. By day Jerry is a language arts and Internet technology instructor at a middle school in Galt, CA. Jerry's state teaching credentials include German, English, literature music, educational technologies, and office systems. While maintaining a full time career (18 years) at the middle school in Galt, Jerry returned to CSU, Sacramento in 2000 to earn a Masters in Education: Educational Technology (iMET1). He completed the MA program in 2002 as a contributing member of a new 75%-online cohort program, which he co-developed with professors at CSU, Sacramento. The Internet Masters in Educational Technology (iMET) is the first such program statewide; it has received full CSU accreditation and is enjoying its seventh cycle. The eighth cohort will begin in the spring semester of 2005 (http://imet.csus.edu).